First up was to get the yogurt started. To be truthful it had been forgotten because the milk was stored in the spare refrigerator in the Cave. By chance something was needed from there and it then was then realised that this was another (overlooked) task on today's mental list. Normally not a problem as it can be done any time except the extra yogurt was required for the visitors. Reminder, write down the schedule for the day. Butter stocks were low and the cream came off the milk before the yogurt starter was added. Some souring starter went into the cream and we were on target once again. Two loaves (bricks) of Sourdough Rye Pumpkin and Sesame Seed were mixed and seated in bread tins in the warming oven. This was using a sourdough starter made yesterday from The Village Baker by Joe Oritz. Yesterday's Sourdough Rye Pumpkin and Sesame Seed was made using Jean's sourdough starter. Just a comparison trial. Both are bricks with the home ground organic wheat flour being the culprit. But it must be healthy. Jean by the way is furiously continuing with house cleaning and making dips and sauces. My contribution was to empty the dishwasher and wash up any pots, pans and trays so that the kitchen was cleared for the next round of cooking. That was followed by couple of quick jobs outside before heading off to the property across the river for some paid work. Feed the Bull and his Nieces, them move the cows into a fresh paddock although they looked pretty full. It's easy to spot when they're full. They flop around the gate to the next paddock but don't bellow when you turn up and there is no mad rush through the gate. Although once through they proceed to munch away at the grass. Last obligation here is to harrow the paddock. At high speed on the RTV the cow pats spread nicely for 5 metres. Back home for a quick shower. The work property is renown for its ticks and the decontamination process is cloths into the washing machine and naked body into the shower. For economy's sake yesterday's work cloths suffice for the work property trip. Yes, a bit smelly but saves on the washing and wear and tear. Ciabatta time. The Biga made yesterday is broken up into the mixer and again The Village Baker's recipe is the Gospel. Skipping ahead here you need to know this task should have been started an hour earlier as the first loaf hit the table piping hot at 6 pm only just in time for the visitors. Baking was still in progress over dinner. But these were outstanding loaves, the best to date. The only aspect that still needs work is to get that crust more crusty. My assignment for the day was to wash all the floors. Forget about mops and fancy utensils. The only reliable and effective method is a bucket, a cloth and onto hands and knees and scrub and wipe and rinse. Being close to the action all is visible and quality maintained. Gel filled knee pads assist but pretty much it's the old Upstairs Downstairs methodology. 3.30pm and Jean's too busy but a swim is fittable for me. Bad news, a quiet relaxing dozen laps and a few stretches is not possible. The pool manager is bored and wants some exercise and the training dummy has just arrived. 20 x 25 Metre laps on 40 seconds. Not too bad with the last few laps getting slower and slower and the rest time remaining in the 40 seconds diminishing. A breather then some sprints back and forth across the pool. Swim one way, run backwards. The water is a perfect 28/29 C. just right to keep from overheating the body and not too cool to make you want to get out. The consensus is to finish with another 10 laps on 45 seconds. Not quite a kilometre in total but a fair effort. Back home in time to get the Ciabatta dough cut into four and onto trays for the final rise and start making the salad. The Sweet Potato is harvestable and we've added Sweet potato chips to the menu. Lovely fresh and soft when baked in the oven with olive oil. Time to get that going. Need more ovens! Visitors arrive. Now down to work. Dish after dish is served and there is so much that the Socca is put aside for tomorrow. The cheeses are a Hispanico (a bit dry), Havarti matured in grape marc (perfect) and a pre ripe Camembert (ok)with Ciabatta (piping hot) and Celery. Hummus and Pesto dips. Salmon Fillets oven roasted with Dukkah and served with Salsa Verde and of course the Sweet Potato Chips. 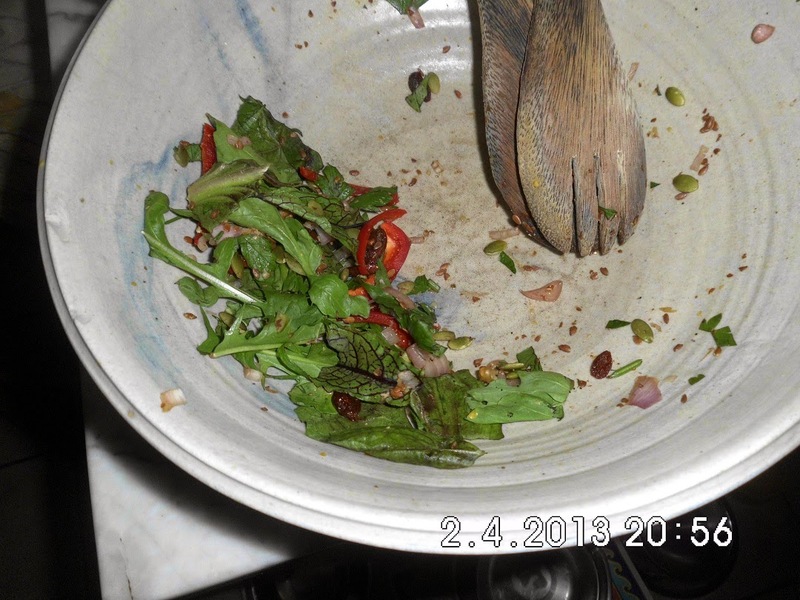 The salad has various coloured leaves with some red capsicum strips for additional colour and is supported by onion finely sliced and scrunched with vinegar and fish sauce. Pumpkin seeds and Linseed (freshly ground) have been added for interest and texture and a small amount of dried Goji and Cranberries. Finally some broken up Walnuts. Some people say that no more than four ingredients should be used in a dressing but it didn't seem to have a detrimental effect by adding an extra couple. Sherry vinegar, olive oil, soy sauce, Fish Sauce, Dijon mustard and Miso Paste. 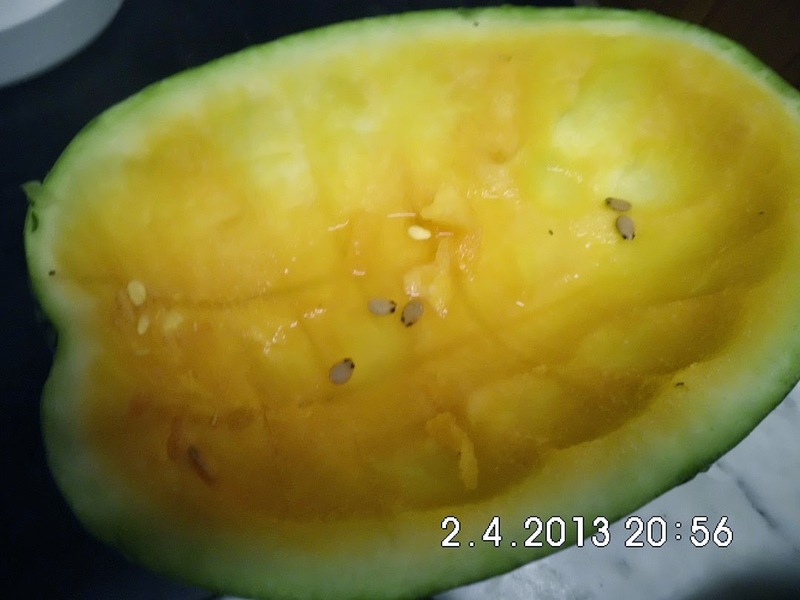 Almost finally, Orange Glow watermelon from the garden with yogurt. And to finish up chocolate shards made with only Coconut Oil, Dutch Cocoa Powder and a little honey. Thanks Anonymous, will have look at them. Like you I've found lots of problems with USA companies shipping (other than Amazon) especially in the magazine area. Australia doesn't appear in their list of 50 states causing all sorts of panic.